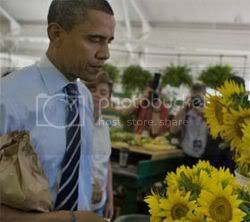 President Barack Obama visiting the farmer's market in Greensboro, N.C. last summer. "So, you know, Michelle set up that garden in the White House. One of the things that we're trying to do now is to figure out, can we get a little farmer's market outside of the White House -- I'm not going to have all you all just tromping around -- (laughter) -- but right outside the White House so that we can -- and that is a win-win situation. It gives suddenly D.C. more access to good, fresh food, but it also is this enormous potential revenue maker for local farmers in the area. And those kids of connections can be made all throughout the country and has to be part of how we think about health." You know, by putting a paycheck in their direct deposit accounts again, as well as a few dollars in their pockets to pay these local farmers at this new White House market? Much good, wholesome food for thought, wouldn't you say, Mr. President? I can't see this happening. Even if it did, it would probably be subsidized. No Shirt, No Shoes, No Service...Baby?